With tonight’s Major League Baseball All-Star Game being hosted by the Angels and their All-Star Arkansan, Torii Hunter, and with the Arkansas Travelers now being part of the Angels’ minor league system, I break from the format and bring you one of my favorite Arkansas sports stories. Faith and perseverance turned a hot summer’s night on the road in the heart of Texas into Hall of Fame Glory. “It hardly seems possible that it is ten years since Ty had his historic night.” Tom Kayser, President, Texas League. In an ordinary baseball game, almost ten years ago to the day, Tyrone warmed up on deck intently but completely without pressure. But having sent three balls over the fence already, the game was firmly in hand and only in the sixth inning. He had a decision to make. 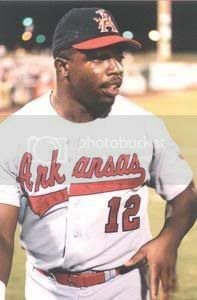 I had watched him play in Little Rock, a thousand miles from Cooperstown as a crow might fly if his spirit was willing. With Tyrone’s bat and weight wielded together, he sometimes fired baseballs out of the park like mortar launched beyond the fence. Whether because of his weight or his fielding or attrition, he was among the older players in the Texas League and getting older. Undoubtedly, Tyrone would have enjoyed a trip to the Big Leagues, cracking baseballs for tens of thousands of fans, watching himself on a Jumbotron, but it escaped me if he played baseball for anything other than pleasure. I know he would have done it for free, like later that week, when, after winning the Texas League All-Star Home Run Derby, he went to pick up his paycheck for a only $100. For affable, likeable Tyrone, an ear to ear smile was the order of the day…everyday. Whether Tyrone would ‘make it’ to the Big Leagues was no mystery. He hadn’t. He never would. He would play for crowds who occasionally would pepper the stands or who would come in droves for “big events” such as clunker-car-give-away or midget wrestling. He didn’t need to worry about his name in lights. His number “12” would brighten the scoreboard. A Monday night, minor league game in the dead heat of a San Antonio summer against the unheralded Missions IS the Definition of Ordinary, and what was left of the home crowd audibly groaned. Tyrone stepped to the plate once again and looked at two men on base. With a smile, Tyrone took his stance and pulled his bat back high, moving one more “at bat” closer to being forgotten, save a few statistics, in the history of minor league baseball. “C’mon, just one pitch,” Tyrone whispered to himself under his breath. Tyrone Horne had made his decision and went for Miguel Garcia’s first pitch. The bat met the ball and sounded the familiar crack, as he launched another shot into the stands. At that instant, as if dispatched by faith and perseverance, a crow bolted from the mundane, insignificant game charged with a message that soared beyond the ordinary, beyond Tyrone Horne’s own shortcomings and the Big Leagues’ glory willingly on its journey toward hallowed Cooperstown. Affable, likeable Tyrone was proud of himself as he trotted around third to touch home plate for a small celebration with his two base runners. The Keepers of Every Statistic began frantically searching computer data and volumes of age-worn, dust-filled pages when his ball cleared the fence. No one was certain of what they believed or what they thought they knew. Tyrone was Tyrone as he enjoyed the rest of the game. He knew his four home runs were different, and if reshuffled, they were orderly, but he didn’t comprehend in the least what he’d done. On July 27, 1998, Tyrone Horne did something that not even Ruth, Aaron, Williams or DiMaggio had done in the major or minor leagues. Tyrone Horne’s accomplishment put him in a club more exclusive than the number of all-time or single-season home run leaders or even those who hit four homers in a single game. You see, in the first inning, smiling, faithful Tyrone, had one runner on base when he belted his first from the park. In the second he was blessed with three runners filling the bases, while in the fifth, he stood alone. After a long, ten-hour bus trip to Little Rock, the national interview requests came. Tyrone Horne’s home run story was a celebration of his unique accomplishment and a wonderful reminder that we have the Freedom, with Determination and Faith in Ourselves, to rise to the Extraordinary from whereever we are. Only with the national media requests did Tyrone Horne finally realize that his was the most exclusive club in the History of Baseball. No one who played The Game professionally before him and no one since has hit The Home Run Cycle — a solo home run, a two-run homer, a three-run trip, and a Grand Slam in one Game. Because of his Extraordinary Spirit to Persevere and unique accomplishment, Tyrone Horne recieved a call for his bat from Cooperstown. Tyrone Horne made his own place in the Baseball Hall of Fame with bombs from the Minor Leagues.